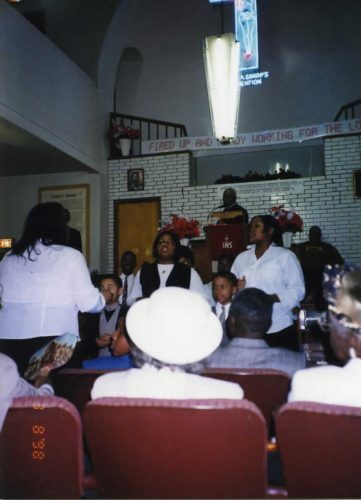 Bishop John Walker presides at a Sunday service at Gethsemane Missionary Baptist Church at 1352 S. Union, that served a thriving African American congregation in the Maxwell Street neighborhood from the 1930s through to the 21st century. The church directors sold the church in 2008 to private investors, who in turn had the building demolished in 2015 when preservationists brought visibility to its 1869 origin as a German Schoolhouse designed by noted German immigrant and Chicago Board of Education architect, Augustus Bauer. The vacant lot was then purchased by developers. All images published by the Maxwell Street Foundation within this website are copyright of the artist and are for educational, personal, and/or noncommercial use only. For any other use, please contact gro.n1555618850oitad1555618850nuoft1555618850eerts1555618850llewx1555618850am@of1555618850ni1555618850.